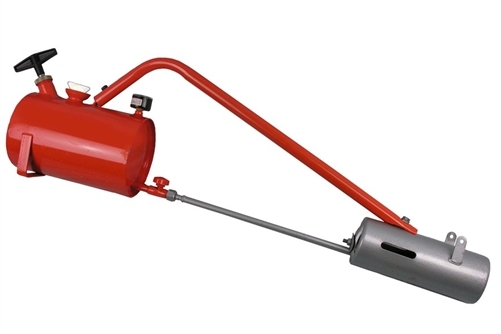 The Sheen X300 flame gun consists of a one gallon tank, integral pressure pump, pressure guage, precision control valve and a burner. Sturdy and simple to operate, the X300 surpasses the most stringent safety standards. The X300 is perfect for all weed killing operations, cultivation of cleared soil and rough ground clearance. Operates at 2000 degrees Farenheit which destroys weeds, spores and bacteria organically with no poison hazards for crops, soil, pets or wildlife. A second gunning incinerates all top growth and weed seeds, leaving a potash rich residue. Easy to use and operate, the X300 can be fuelled by domestic oils such as kerosene, or paraffin. A Hood and Trolley are available as optional extras for this flame gun. Please see below for more details.